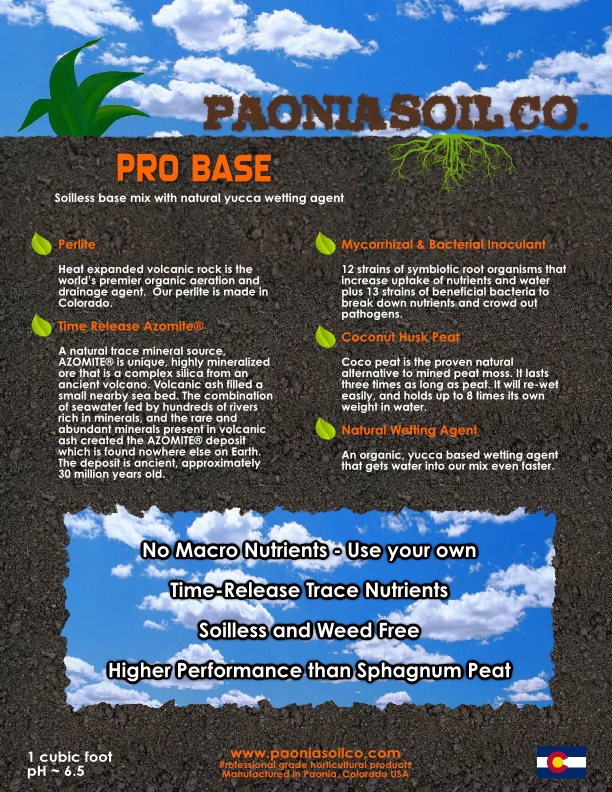 Pro Base – Paonia Soil Co.
Soilless coco and perlite base mix with natural yucca wetting agent, light trace minerals and myccorrhizae. Heat expanded volcanic rock is the world’s premier organic aeration and drainage agent. Our perlite is made in Colorado. Coco peat is the proven natural alternative to mined peat moss. It lasts three times as long as peat. It will re-wet easily, and holds up to 8 times its own weight in water. Our coco is some of the best in the world. It is super well rinsed by the monsoon rains in India. Heat expanded obsidian creates root aeration and drainage. We are now using bigger size. A natural trace mineral source, AZOMITE® is unique, highly mineralized ore that is a complex silica from an ancient volcano. Volcanic ash filled a small nearby sea bed. The combination of seawater fed by hundreds of rivers rich in minerals, and the rare and abundant minerals present in volcanic ash created the AZOMITE® deposit which is found nowhere else on Earth. The deposit is ancient, approximately 30 million years old. 12 strains of symbiotic root organisms that increase uptake of nutrients and water plus 13 strains of beneficial bacteria to break down nutrients and crowd out pathogens. An organic, yucca based wetting agent that gets water into our mix even faster.